This is the story of the first seventy-five years of cave diving and exploration at Somerset’s famous Wookey Hole Cave, or Caves, as successive show cave managements have preferred to call their attraction. Since the pioneer ‘hard hat’ dives of 1935, generations of cave divers have explored the River Axe upstream from the Third Chamber in the show cave discovering nearly 4 km of both submerged and above water cave passages to reach the present limit which lies 90 m underwater (26 m below sea level) and 1 km north-east of the cave entrance. This book was conceived in 1985 to mark to the Golden Jubilee of that underwater exploration. Between 1985 and 1987 Jim Hanwell collected the reminiscences of those involved with cave diving in Wookey Hole Cave together with a vast collection of relevant illustrations The stories comprised either first-hand accounts by the divers themselves or Jim’s own re-telling of each participant’s contribution based upon personal knowledge and interviews. The material was carefully edited and arranged to form the first twenty-one chapters of this book. Sadly, however, no one volunteered to take on the final task of publishing the book, as originally envisaged, and the project faltered. Only thirty-three un-illustrated copies of the text were kindly produced by Dave Turner, perfectly bound and distributed to the original contributors. Then, as has often been the case over the years with exploration under Mendip, success in one cave inspires breakthroughs in another. So it was that publication by the Wessex Cave Club of Swildon’s Hole: 100 years of exploration in 2007 provided the ideal spur: Wookey Hole Cave is, after all, the ‘other end’ of Swildon’s in many respects, not least regarding the history of cave diving. 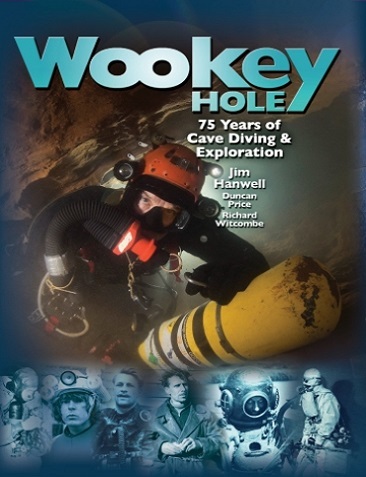 The principal editors of the Swildon’s book, reinforced by a new generation of cave divers, have thus taken on the challenge of up-dating the accounts of upstream exploration of the subterranean River Axe in time for the seventy-fifth anniversary of the first Wookey Hole dives in 2010. A deliberate choice has been made to retain the contents of Jim’s work in its original form, with only light editing and correction where necessary. Regrettably, many of the characters mentioned are no longer with us, through infirmity, old age or mishap, and footnotes have been inserted in the text at appropriate points to record their passing. Further chapters have been added to recount the events and achievements of the subsequent twenty-five years in Wookey Hole Cave and other relevant sites. The latter include some of the swallet caves on the plateau above where cave diggers and divers have been working just as hard to close the gap between these feeders and the great resurgence at Wookey. The new book thus divides into two parts (known colloquially to the editors as the ‘Old’ and ‘New Testament’ respectively), comprising the original twenty-one chapters covering the period 1935 to 1985 compiled by Jim, and the recently written chapters from twenty-two onwards which deal with the period from the mid-1980s to the present day. As Jim explains more fully in his introduction, the coverage of the various phases of exploration is by no means uniform, as the individuals concerned have been allowed to tell their stories in their own, sometimes idiosyncratic, way. By the same token, the terminology and measurements used – imperial or metric – reflect the author’s and not the editors’ preferences. This may annoy some, but it more faithfully represents the atmosphere and thinking of the time, and adds to the colour and richness of the overall story. A huge number of people have helped in the compilation of this book, not only the direct contributors, including photographers, but those who have helped make its publication possible. Martin Grass has acted throughout as the book’s ‘Commercial Manager’ and the British Cave Research Association has put forward money, appropriately drawn from Graham Balcombe‘s substantial bequest to them, to fund its printing. The striking design and layout of the book is a testament to the artistic flair of graphic designer and caver, Mark ‘Gonzo’ Lumley. A full acknowledgement of all who have given their time and energy to this project appears at the end of the book. The editors owe them a great debt of gratitude for without them the book would never have seen the light of day.